Australian firm Lara Calder Architecture designed Eco House which was awarded first prize last year in the Future Competition held by Australian Green. Eco House is an intelligent response providing a suitable and sustainable building form for suburban development in Western metropolitan Sydney. 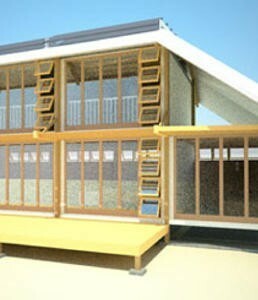 It offers an alternative to resource-hungry low-cost project homes. In its intended suburban context, a provision for cars has not been given a high priority.The primary structure is six timber portals. Over these portals a high-tech fabric ‘fly’ is suspended. In each portal bay pre-fabricated units are suspended and configured to produce a flexible interior living environment. The prefabricated pods have weatherproof roof, walls and floors; however the primary weather barrier is the fabric canopy.Materials are generally selected for their low embodied energy. The structure necessarily includes some steel and plastic-based elements; however these are minimized in favour of predominantly timber, cement and plaster products. The portals are laminated timber pinned to concrete footings. The fabric is a PVC waterproof membrane while the units are clad in painted fibre-cement with a liquid membrane roof.